Tom wrote: Wow, I'm in. As lurker as I am, may I candidate myself to get such a generous gift? Great! I would love to hear from the moderators on how is that working so far. Are you referring to pledge transfers in general? Because if so, the mods have no power over that, only Josh himself. (Very) long time lurker. I'm willing to transfer my pledge to a "good home", for the sake of closure. If anyone can propose a way of doing it? Below is what I pledged for. I'll take a notional $5 for it. DWMagnus wrote: Are you referring to pledge transfers in general? Because if so, the mods have no power over that, only Josh himself. Oh, I know. But I think that in the last transfers here the mods were the ones that reached to Josh due to the communication shortage. I would be interested in that as well. I seem to have missed several posts in this thread. Well, not sure if this is working or not, but I'm putting my $75 tier pledge up in here, if anyone is interested we can negotiate the price. I really hope Josh can pull it off in the end, and when/if he does I'll certainly be buying a copy. I am interest in transfer my pledge ....i dont want to continue waiting for this project ....how i can transfer my pledge ? WASAVA wrote: I am interest in transfer my pledge ....i dont want to continue waiting for this project ....how i can transfer my pledge ? 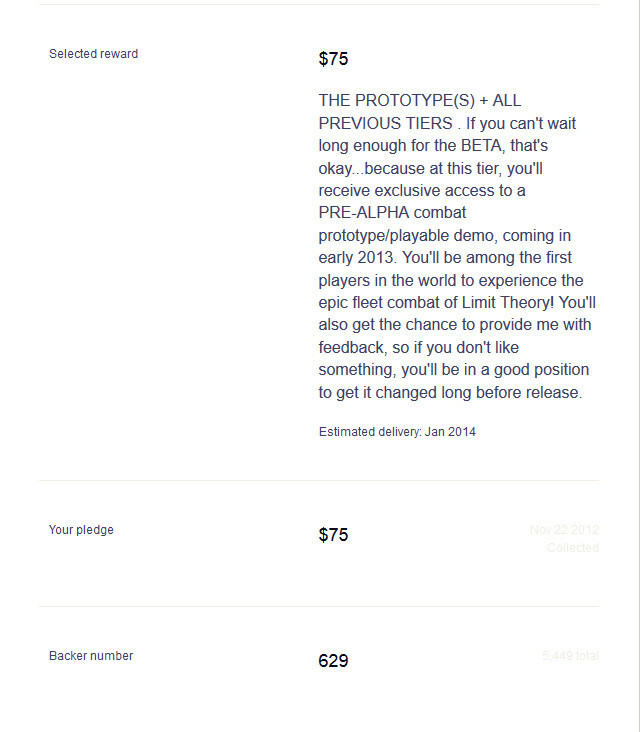 what pledge tier did you take? the 250$ one and put some extra 20 bucks into it? I'm interested in transfering my pledge. I'll certainly buy a copy if the game ever comes out, but, for various reasons I don't expect to be alive when that happens. I also lack confidence in Josh participating in any way in the brokering of such deals. It has been said by others that Josh is the only one that can make transfers happen, but I disagree. Given that the rewards are promised to be DRM-free, it's entirely possible to transfer my stake in the game myself. Either sending the keys or whatever else is granted at the end of production. One way or another, whether or not Josh is involved we can handle transfers ourselves. Open to offers on price, but I'd like to get my investment back. Given that the rewards are promised to be DRM-free, it's entirely possible to transfer my stake in the game myself. Either sending the keys or whatever else is granted at the end of production. One way or another, whether or not Josh is involved we can handle transfers ourselves. Without Josh there is no real transferring of pledges, at least until the game is actually released, because a seller has nothing they can actually transfer. There is of course nothing stopping someone from sending a seller some money and accepting a promise that a key would be forthcoming once the game was released, but there is a huge level of trust required in that transaction. If there comes a point where pledges are able to actually be transferred, I would be interested in picking a pledge up- preferably the 30 USD tier or lower. There is of course nothing stopping someone from sending a seller some money and accepting a promise that a key would be forthcoming once the game was released, but there is a huge level of trust required in that transaction. This is true. I wonder if there's a way to make an enforceable contract prior to cash transfer. There's got to be a way to digitally sign binding contracts in web-space tied to real ID but anonymous unless there's a breach. It's 2016, I feel like that should exist. Anyone know? I'm interested in what you find and what works best for you. Please post your findings here. I mean, it looks to me like you found it BFett. So we have an option for personal, individual pledge transfers. No reason to rely on an unreliable third party. Any transaction done in this manner is still on shifty ground in my opinion. That article simply states that electronic signatures can be legally binding in the USA. So a buyer and seller draft a simple contract and e-sign it, then the buyer sends some money to the seller and sits on the contract until a game is released. At the time of release they are still relying on trust more than anything that the seller will actually send a key to them. Is anyone truly expecting a buyer to take legal action to force a seller to live up to their side of the deal? When we're talking about $20 (or even a couple of hundred) the idea of getting a lawyer and going to small claims court (if both parties happen to live in the same country) is a little far fetched considering the game itself will be out and much cheaper to procure than a lawsuit would be. The hurdle to a transfer is not getting a better promise from the seller, it is creating some automated way for the key to transfer upon release so a seller cannot back out, or simply forget, or whatever.